If you want to distribute the printer driver to many computers on your enterprise network, this section will give you some ideas on how to do that. I will try to cover a couple of different ways to do this depending on your infrastructure. 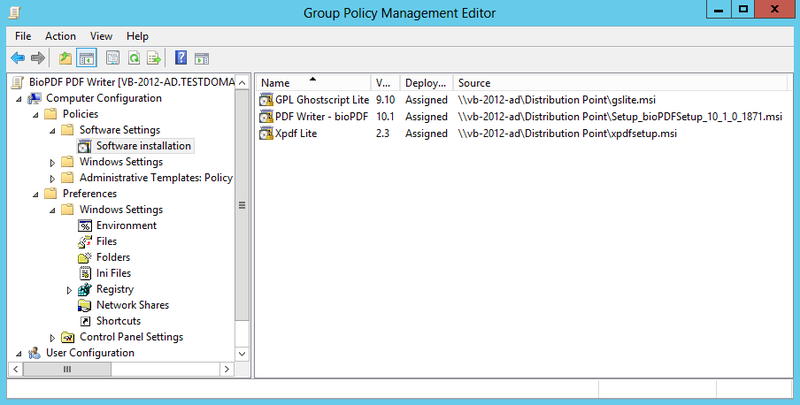 In case you use Active Directory (AD), you may want to distribute it using a Group Policy Object (GPO). Alternatively, you can distribute it using a network share and a script such as a login script. Most large Windows based computing environment have the ability to distribute software packages using AD with GPO. Here is what you need to create your GPO with the PDF Writer and your license. After creating a GPO, you will need to add the printer MSI package along with the dependencies. On the download page, you will find the link to all the MSI packages you need to add. When you bought the license, you received a license.xml file that usually needs to be installed in the printer's application folder. This can also be done using AD and GPO. Files can be distributed in the GPO under Preferences->Windows Settings->Files as shown in the image below. It is important to know that the preferences (GPP) does not work under Windows XP unless you have a hotfix from Microsoft. If you do not want to use the Windows XP hotfix and GPP then you have the option to distribute the license using a GPO startup script or a logon script. In case you do not have or do not want to use GPO to distribute the printer then you can use the following alternative solution. This approach requires that you have basic understanding of the unattended installation and distributing dependencies. Automatic distribution of required components as well as the printer driver itself. To solve these problems I have developed the batch file shown here. If you place this batch file in a folder together with the setup program the installed version can be checked every time you run the batch file. If the version does not match the one set in the VersionName variable the setup program is started. Change the settings in the beginning of the batch file to match your environment. You can include the Ghostscript distribution gslite.exe and other dependencies together with this if you want to distribute these with the batch file. One important detail in this scenario is that login scripts run in the security context of the logged in user. This is a problem if the user does not have permissions to install applications.